This article discusses several ways to give readers a free sample of content that is typically for sale. Giving away a free sample can be a valuable tool to convince users to convert to paid customers. The Inclusive Issue feature of your app lets you automatically give away a specific Mag+ Issue or Issues to users when they open your app for the first time. You can choose which Issue the customer gets, and change it at any time without rebuilding the app—this is a live option that always serves your latest settings. As of Mag+ v5.0, users get a popup dialog when they first open your app letting them know they are entitled to a free Issue. They can then choose to download it. The text that appears in the popup message can be customized in the app's Application Texts, available in the customization options within the Mag+ Publish portal. If a user deletes your app and downloads it again, they will be offered the Inclusive Issue again. Therefore, if you change the Inclusive Issue every month, users might discover that they can get your content for free if they keep deleting and reinstalling your app. 1. Go to the Mag+ Publish portal <http://publish.magplus.com> and click on the "Apps" tab. 2. Now click on the "Live Settings" tab to the right of the app platforms. 3. Scroll down to the "Complementary Content" area and select an Issue from the drop-down menu. 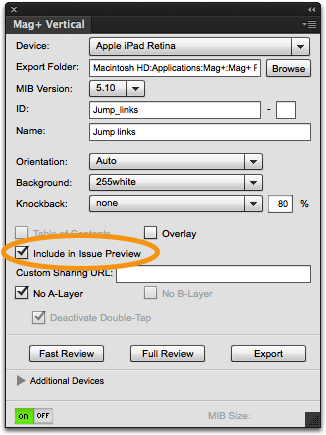 In the Mag+ InDesign Plugin, there is an option you can check called "Include in Issue Preview." If this is checked, the system will include an image of the first page of the current Vertical as a preview. Users see these previews by tapping the cover of any Issue in your app's store. If "Include in Issue Preview" is checked on multiple Verticals, the user can swipe left and right to see all the preview pages. 1. 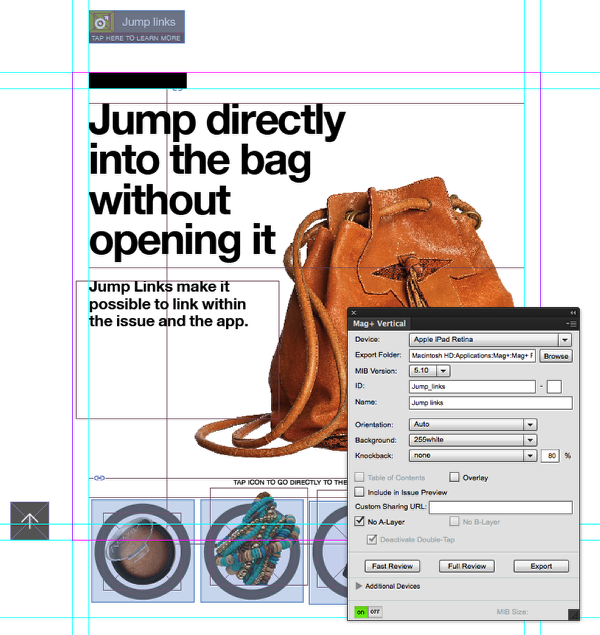 In InDesign, open your layout and show the Mag+ Vertical panel. 2. Click on the checkbox "Include in Issue Preview." 3. Save your document and export it as a Vertical for assembly in the Mag+ Production Tool. Some customers choose to create a separate free Issue that includes a sampling of content as a teaser for an associated paid Issue. These publishers typically put a badge on each page that says "Preview: Tap here to buy the full Issue!" which is linked to the paid Issue. Make sure you have created your Paid Issue and uploaded it to the Mag+ Publish portal so that you can get its Issue ID for use in your Preview Issue. 1. Create your Preview Issue and create a badge, object, or link that will take the user to your Paid Issue. When the user taps on this object, your app will show them the Issues screen with the Paid Issue. 2. 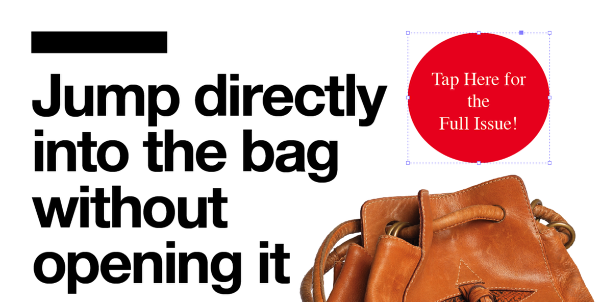 Create a Mag+ Jump Link from your object that will take the user to the Paid Issue in your app's store. 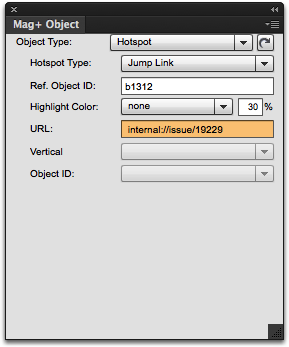 For more information on creating Jump Links in inDesign, please read the article "Creating Jump Links." You will need the Issue ID or GUID of the Paid Issue to enter into the URL field of the Jump Link (see highlighted field above). To find out how to find the Issue ID or GUID of your Paid Issue, refer to the article "Reference - URL Format for Links in Apps" under the section "External Issues." 3. Finish creating your Preview Issue and upload it to the Mag+ Publish portal. For more information on creating Issues and uploading content, read the articles in the sections "Exporting From InDesign," "Assembling Your Issue," and "Publishing Your Issue." 4. Make sure your Preview Issue is set to "Free Issue" under the Issue Settings > Payment section. If you sell a subscription, you can offer a trial period to your readers. The different marketplaces have different areas where you set Free Trial information. 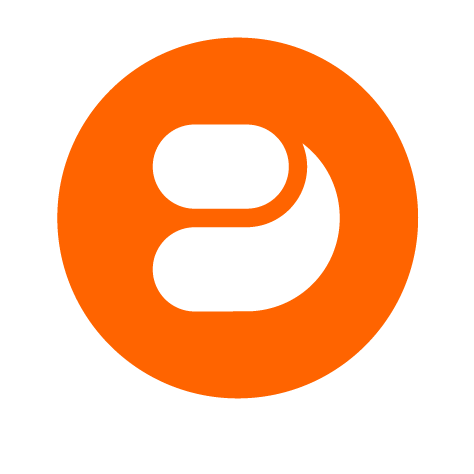 Typically, the Free Trial is specified as part of the Subscription set-up of an in-app purchase. 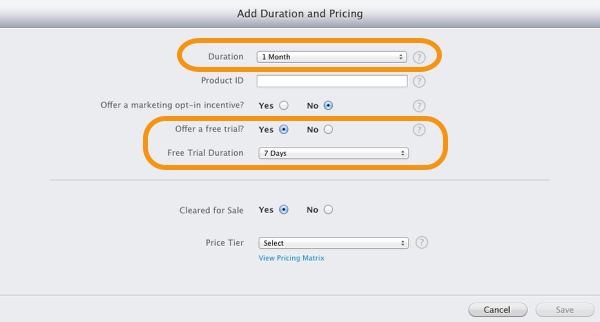 For iOS, Free Trials are specified in iTunes Connect for Auto-Renewable Subscriptions in the Duration screen. 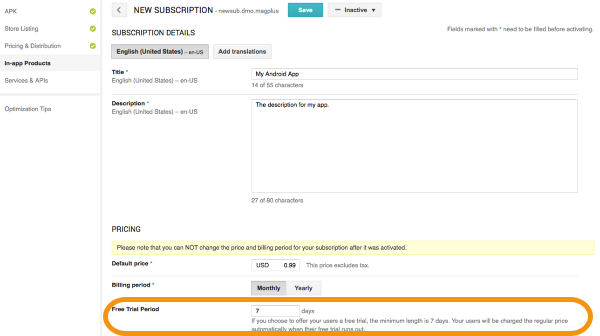 Note: The Duration is the normal duration for your subscription: weekly, monthly, yearly, etc. The Free Trial Duration is how long you will offer the trial for free before the reader gets rolled into the paid subscription. 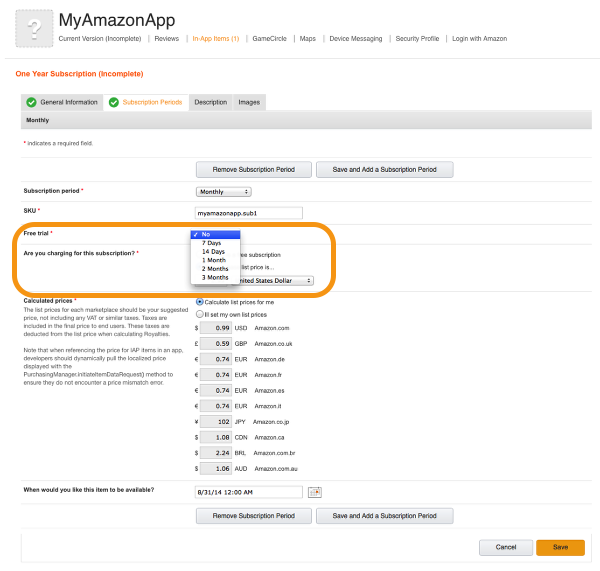 The subscription will auto-renew according to the Duration you choose and as long as the user has "Auto-renew Subscriptions" enabled. For Android, Free Trials are specified as part of the Subscription settings. For Kindle Fire, Free Trials are specified under In-App Items > Subscription Periods.